It is with a sense of gratitude that I read the ‘Opinion’ titled ‘A Flawed Argument’ by Savitri Goonesekere in last Friday’s issue of The Island, in which she has explained that it is not the discrepancy between the Sinhala and the English versions of the 19th Amendment, but the principle – “the Golden Rule” – of relevance to an adjudication of President Sirisena’s removal of Ranil Wickremesinghe from the premiership is that “Constitutional Provisions must be given a meaning that is purposive to fulfill the objective and intention” of the related provisions. When a legal luminary of the stature of Professor Goonesekere imparts her wisdom and knowledge no sensible layman would dare dispute her. Yet it would not be insensible for a layman like me to request several vitally important further clarifications on her interpretation. First of all, is it not essential to take into consideration the qualifications pertaining to the near unanimity that prevailed in our parliament over the need to curtail presidential powers at the time the 19th Amendment was enacted. In that context, Professor Goonesekere, shouldn’t we look carefully at the general stipulations of the constitution (copied below) on how the “sovereignty of the people” should find expression in the legislative, executive and judicial power configurations of government? Or, is this concept of ‘sovereignty of the people’ a whole lot of rubbish? (a) the legislative power of the people shall be exercised by Parliament, consisting of elected representatives of the people and by the people at a referendum. (b) the executive power of the people, including the defence of Sri Lanka, shall be exercised by the President of the Republic elected by the people. (c) the judicial power of the people shall be exercised by Parliament through courts, tribunals and institutions created and established or recognised by the Constitution or created and established by law, except in regard to matters relating to the privileges, immunities and powers of Parliament and of its Members wherein the judicial power of the people may be exercised directly by Parliament according to law. Likewise, among the new constitutional provisions brought into being by the ‘19th A’, there were several others that did not relate to presidential powers vis-à-vis the Prime Minister and the Parliament. For instance, there were those that elevated the concept of ‘National Government’ to constitutional status, those pertaining to presidential powers over Provincial Councils, and those providing for the establishment of a Constitutional Council and nine “independent” Commissions. In deciding on the ‘objective and intention’ of the legislators lending their support to the clause of the bill in professorial dispute between Goonesekera and her former Law Faculty colleague G. L. Peiris, is it not relevant to take into account the possibility of impulses other than those pertaining to the powers exercised by the President last week that swayed them to support the amendment? Among the other impulses I refer to, there were, for instance, the introduction of the concept of ‘National Government’ and the expansion of the size of the cabinet and the number of ministerial posts which that entailed. Thus, does Professor Goonesekera imply that the related considerations are of no relevance now to determining the ‘objective and intention’ of the members of parliament? If the good lady does, it would be quite incredible. The discrepancy between the Sinhala and English versions of a single provision of the ‘19th A’ which Professor Goonesekera considers as being of little relevance to a probe into the ‘objective and intention’ of the ‘19th A’ comes closely in the heels of other more general submissions made in an article co-authored by her on behalf of the illustrious ‘Friday Forum’ (which The Island carried), the thematic thrust of which was that President Sirisena is guilty of gross violations of the Constitution. In that context I find it necessary to argue that the near-exclusive focus on constitutional issues in the ongoing public discussions, regardless of the unassailable eminence of the ‘Man Fridays’ on whose behalf she had written that piece, is it itself thoroughly flawed. The crux of my submission here is that the disclosures made by President Sirisena in the course of his ‘Address to the Nation’ on the evening of 28 October are of far greater relevance to the debate on propriety of the reforms he implemented than constitutional issues. Admittedly, the president’s charges such as the likely complicity of his former prime minister in the gigantic “Robbery of the Central Bank” caused no surprise in that they were no more than confirmations of widely prevalent suspicions based on the well known relations that prevailed among the main participants in that heist, and on media reports on proceedings of the ‘Bond Commission’. Several other indictments such as Ranil Wickreme-singhe’s autocratic disregard of the president’s constitutional authority (as he did even in his earlier spell as prime minister from December 2000 to April 2004), and his violation of the tenets of cabinet government were also widely known as features of his personal style of leadership and management. Nor is there a surprise in his pathetic dependence on the support of his guardians among the global powers to recover the lost position as the country’s ‘strongman’, and in the blatant duplicity seen in the response of the NATO powers to his appeal. But there were two other presidential indictments of far greater significance which were well within the realm of criminality and moral turpitude that have remained sidetracked. The ‘Address to the Nation’ was not read from a script. The president, as usual, was employing his extraordinary communication skills in flawless Sinhala. Yet, since there were public announcements about the impending ‘Address’ throughout that day, listeners were entitled to assume that it was well prepared and carefully designed, quite unlike the extempore pronouncements which some of our garrulous politicians make from public platforms and the floor of the ‘House’. It must also be recalled that the indictment was made after protracted investigations including prolonged interrogation and the incarceration of a Deputy Inspector General of Police. Many in the President’s audience are also aware of the enormity of the losses our nation has suffered since the late 1950s as a result of assassinations targeted at national leaders. It has also been widely observed that such losses have not been confined to scarce leadership talent, but have invariably resulted in the emergence of mediocrity at the apex of the political system and at various levels of its sub-national hierarchy. Iraq (and the annihilation of an estimated 700,000 Iraqis including Saddam Hussain), and the reduction of the unique city of Damascus to rubble rank among its other major contributions to safeguarding democracy. In Nepal the officially published version of King Birendra’s assassination being attributed to Prince Dipendra (his son and heir to the throne) is considered by some as the cover-up of an externally engineered plot. These are only a few examples known to us of ‘regime changes’ operations conducted in the past few decades. What the foregoing considerations point at is that people urgently need the President to elaborate and substantiate his indictments and the former Prime Minister to answer them without confining himself to stating mama eva prathikshepa karanava (I reject them). The latter, in particular, is absolutely vital because his image has been severely tarnished. That the popular support he had at the time his party secured about 106 parliamentary seats has been severely eroded was made plainly evident by the results of the nation-wide local government polls of February 2018. 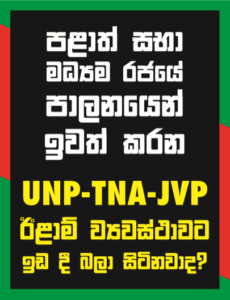 There is also no secret about the fact that the delays in conducting elections to Provincial Councils is due mainly to his fear of facing the electorate. The parliament remaining prorogued until 16th November gives both of them – President and the ex-PM – adequate time to elaborate their case.